Like any sensible, shoe-loving person – I tend to get dressed from the soles up. So yesterday’s trip to TriBeCa began with these blue suede tasseled numbers, and took a fairly preppy route from there. For me, it always really feels like Spring once Easter is here. 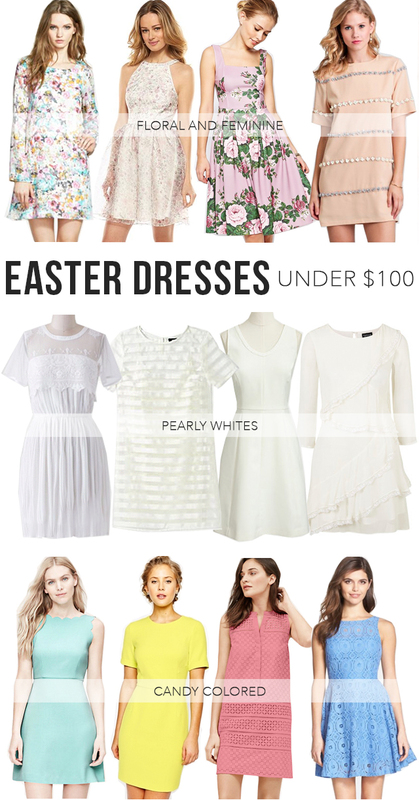 Tulips on every corner, pastel candies in every shop and – probably most excitedly – Spring dresses to be worn. The weather is having a hard time making the turn here in New York, but I’m a firm believer in the power of a great dress. So perhaps one of the above, will do the trick? And if Easter isn’t your thing – these options would be great for those spring wedding/ shower/ brunch/ birthday invites. Or, since all are at less than $100 you can pick one up simply to celebrate the return of bare legs. I’m torn between the all out femme of this one or the simplicity of this one. We finally got almost Spring-like temps in New York yesterday and even though it was paired with overcast skies, you won’t hear me complaining. Mainly because it meant giving my legs a break from tights and getting to wear these Joules rainboots.. which are like sunshine on a rainy day (in shoe form). I’ve been talking a lot lately about buying smarter when it comes to my wardrobe and streamlining when it comes to my style. And this outfit pretty much sums that all up.